Private Internet Access, sometimes known simply as PIA, is a popular and well-known virtual private network (VPN) service. PIA has received recognition in PCWorld, Forbes, CBS News, Business Insider, and other major publications. With more than 3,000 reviews on Google Play and a rating of 4 stars out of 5, they are well worth a close look if you are shopping around for the perfect VPN service for your home or mobile device. PIA provides you with a firewall, encryption, and IP cloaking to protect your identity, and allows you to access the Internet through VPN servers around the world. The software is compatible with a huge range of operating systems and is very affordable starting at just $3.33 per month. Sadly there is no free trial available, but there is a refund policy. You want to watch streaming content in a country where access is blocked. With PIA, you can access that content and watch any multimedia you want. Enjoy an uncensored Internet. You are on a network which is blocking services like Gmail that you want to use. You do not trust the network you are on and you want to make sure that your transactions are encrypted so no one can access your data. You want a faster connection to browse on. Speed results are mixed on this VPN, so whether or not this applies to you may depend on your geographic location and the type of protocol you want to use. Private Internet Access provides all of these features. Speed may vary depending on where you are browsing from and what you are doing, but in general, users report that the network is quick and reliable. Let’s check out the supported operating systems and devices you can use PIA on. Thanks to the versatility of Private Internet Access, you can use the service on pretty much any device you can name. Whether you want to use PIA at home on your PC or Mac or on the go on your Android or iPhone, you are good to go. It is a drawback that there is no free version or free trial for PIA. You have to make a purchase in order to try it. A good rule of thumb when testing out VPNs is to purchase the minimum package (in this case, one month). That way you can make up your mind about whether you really want PIA before you make a larger purchase. The single month is still very cheap, so you’re getting a great deal regardless. There is only one tier of service for PIA, so whatever package you buy, you will get all the features included. The packages are split up according to how many months you are paying for. The more time you buy at once, the bigger your discount. As you can see, those are all outstanding deals, especially the 12-month package. If you decide you like PIA, purchasing a year can earn you a substantial discount. The closest thing to a free trial offered by PIA is their refund policy. If you are not satisfied with PIA, the company will refund you your payment as long as you post the request inside of seven days. This allows you to try out Private Internet Access risk-free for a week. This is a Eurocentric service; most of the gateways are located in the United States, Canada, and Europe. Countries in Europe include the UK, Switzerland, the Netherlands, Sweden, France, Germany, and Romania. There is a single server in Hong Kong, but no other servers in Asia, and none in other continents. There is no data on how many IP addresses are available. Bandwidth is unlimited, no matter what package you buy. That’s a pretty great feature for a VPN that costs only $3.33 per month! No data caps are mentioned anywhere on the site. So you can feel free to browse, download, and stream to your heart’s content. Despite it looks very oldfashion, not to say primitive, PIA is simple and easy to use. You can easily select a location from the list, and you can choose to have the program auto-connect when the app is started. You also can choose whether PIA should load when you log on or not. You can set the connection type you want and set up port forwarding. 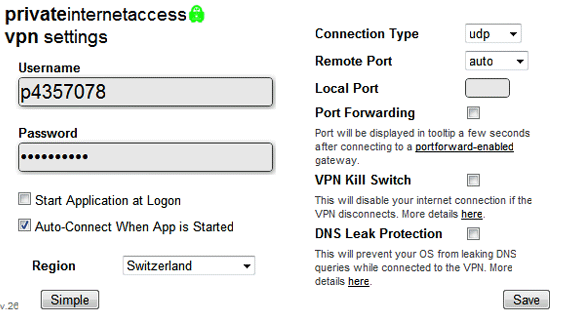 DNS Leak Protection is included, and you can choose to disable your internet connection if the VPN gets disconnected. Looking over customer reviews for this VPN, it is clear that this is a stable service, but was not always so in the past. Even on PIA’s own website, there are discussions about past releases which featured problems with crashing and disconnects. It appears however that these issues have been remedied, as many reviewers on third party sites indicate that newer versions offer stable, reliable performance. We have accomplished several tests of PIA on our own and find the connection very stable during our standard 48h testing. So it looks like on the whole, Private Internet Access is reliable and easy to use. This is another area where there are mixed reports (which is pretty typical with VPNs). Some users report very slow speeds while using Private Internet Access, while others report speeds that are comparable to their normal speeds or even slightly faster. A lot of factors can affect the speed of PIA VPN, including your location, the location of the server you are using as your proxy, and the protocol which you are using. If you are getting a slow connection, switching servers or changing your protocol will often resolve the problem. This is a good reason though to try out a month of service before you go ahead and buy a year package. Private Internet Access takes security seriously, as their name implies. OpenVPN uses 128-bit encryption, which is pretty much the industry norm. Other protocols and security options are available, depending on how you want to access the web. One great thing about this company is that they do not maintain logs at all. Some VPN services hold onto logs for a few days or even a couple of weeks. With PIA, you don’t have to worry about that. Your browsing will remain anonymous. PIA even allows you to pay anonymously using gift cards, which keeps your identity completely dissociated from your PIA account. For those who have serious privacy concerns, this is a great courtesy. According to the Private Internet Access website, the company provides customer service 24 hours a day, 7 days a week. Unfortunately there is no telephone number on the company’s site, but there is a live chat window. When we checked this window, there was a pretty long wait time to talk to a customer service agent, but the window did tell us how many people there were in line ahead of us, and eventually an agent did answer. The customer service agent who answered the line was fast, friendly, and knowledgeable, and was able to answer our questions within minutes. There is not a lot of information available on customer support from other reviewers online, but the few comments we did see were largely positive. This also tells us most users never had to contact support in the first place, which is also a good sign. Private Internet Access is not a perfect service: there have been problems in the past with stability, and reports are mixed about speeds. It is secure, however, and there are great privacy features like the option to pay anonymously. The user interface is simple, streamlined, and easy to learn how to use. Customer service is fast and reliable, and there is support for a wide range of operating systems and devices. The biggest detractor with Private Internet Access is probably the fact that there is no free trial version. The 7-day refund guarantee is great, however, and does give you a chance to find out whether PIA is right for you without financial risk—plus, you can hardly complain about $6.95 for a month of service. That represents a typical price for mid- or lower-tier service with a lot of VPN providers, and with PIA you are getting the full version of the software with all the features for up to five devices. At $3.33 per month for a 1-year package, you are going to be hard-pressed to find a cheaper deal on quality VPN service. Private Internet Access is well worth a try.